Every great makeup application starts with a great base, and after your skincare, the next best way to create a beautiful foundation for your look is with complexion products suited to your skin type. For those with more sensitive skin, serious skin conditions, or illnesses that affect the skin’s appearance, this can be an extremely difficult task, but luckily, there’s a brand on the market just for those more compromised skins- Youngblood Mineral Cosmetics. The complexion products offered by Youngblood are made with 100% mineral ingredients, making them some of the safest options for complexion makeup in the industry. Each product is carefully crafted to ensure the best possible results for those with compromised, irritated, or sensitive skins. Youngblood’s Mineral face products are safe for use by those who have recently undergone surgical procedures, dermatological treatments, or esthetic treatments, so no need to worry about your skin reacting to your complexion products post-chemical peel: you’ll be out the door looking fresh and even in no time! Youngblood doesn’t skimp on quality or staying power by using mineral ingredients- these products are meant to last, whether it’s a long night out with friends or a long workout. This makes them a perfect choice for folks who are constantly on the go, ensuring a fresh, even complexion no matter what the circumstance. While many lines offer mineral cosmetics, not every line is as dedicated to inclusivity as Youngblood. While many shade ranges fall short of colours that match every skin, Youngblood ensures you’re able to find the perfect shade for you, no matter how light, dark, or unique your shade. Youngblood also ensures it’s dedication to making cosmetics that are safe for everyone, including baby bunnies, by providing cosmetics that are 100% cruelty free. Those with any ethical concerns will be happy to know these cosmetics not only treat skin gently- they also treat the earth’s creatures with the same tenderness. 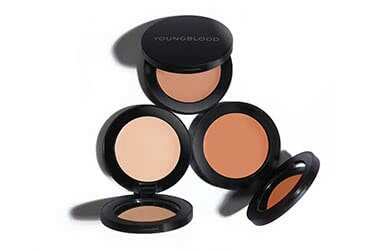 Youngblood goes past your standard mineral powder to create complexion products for every preference. Youngblood takes care of your look from start to finish with their Mineral Primer, Ultimate Concealer, and Loose Mineral and Liquid foundations. There’s even a Contour Kit for those looking to sculpt and perfect with safe, effective products! Whatever look you’re going for, Youngblood Mineral Cosmetics has the perfect offering to suit you. I have combination skin, prone to breakouts and have trialled a few mineral foundations. I would say this is one of the better mineral foundations out there. It is very lightweight, but still gives good coverage. It also has a nice, fresh smell. I used findation to find the right colour for my skin, but the shade I purchased (Sand) wasn't quite right (strong yellow undertones), so I have to correct with a setting powder. I would recommend trying to find your colour match in any store before purchasing online. The palette is suited for people with a warm toned, light skin. I tend towards cool tone so find the colours don't truly suit me, throwing a bit orange for my taste. The formulation is nice, it lasts very well, and it doesn't create weird issues with the foundations I have paired it with (ELDW, mufe uhd, fenty, bounce, loreal24h)(cracking, flaking, separation etc). I love this palette despite the tonal issues, and will often pair it with marc jacobs bronzer to create dimension. I would recommend this to people who are neutral or warm toned.